Integrate, scale and analyze data to improve customer experience and compliance with a single solution. 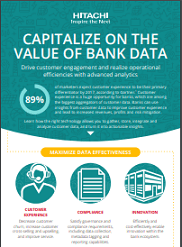 As some of the biggest aggregators of user data, banks have a unique opportunity to improve customer experience with data insights. Customer experience is a primary differentiator for marketers – learn how to stand out with this infographic.